A wonderful undiagnosed breech birth at home – the best kind! This story is also included in 'Where the Heart Is - stories of New Zealand home birth' by Carla Sargent, available through Amazon.com. Throughout my pregnancy, we had a feeling that our baby was a boy. It was just a hunch as we opted not to have the 20 week scan and so knew nothing more than the fact that we were expecting just one baby. People asked me, “What are you having?” I took such pleasure in staunchly saying “a baby!” We named our baby ‘Donkey’ as he loved to kick and move. I really liked being pregnant and was lucky to experience no sickness or major aches and pains. I was happily riding around on my bike into my 41st week and went to weekly yoga classes led by another local midwife. At yoga I loved the time we spent focussing on our bodies, our babies and readying ourselves for birth. Our midwife would stay for hours at our antenatal home visits, chatting endlessly and effortlessly about birth and parenting with us. We all tried to watch the clock, but it was kind of hopeless! We just got along so well, and it was a huge plus for me that she and Shawn connected. It felt good to have a midwife that Shawn could talk to and ask questions of so easily, and who shared his huge love of good coffee! The books that my midwife lent me were varied and colourful. I lapped up Michel Odent’s writing and loved the Tummy Talk magazine where I first discovered Dr Sarah J Buckley. I learnt so much from the books, and from both my ‘yoga midwife’ and my own midwife. I remember talking to her one day about luck in birthing. She told me, “It’s not about luck, it’s about good health, good information and lots of trust”. I have never forgotten that and it is a mantra that can guide us in more than just birthing. Knowing now how Beren was lying in my tummy I can understand more of the final weeks. I felt Beren’s movements a lot throughout the pregnancy, but whenever my midwife would palpate my tummy and talk about his position, I could never picture it in my head. I would try to feel for myself and not quite manage to feel what everyone else did. I worried occasionally that I wasn’t connected to my baby because of this, but the feeling didn’t linger. He had us all fooled, the little rascal. Seeing 40 weeks come and go was more of a big deal for others than it was for us – we trusted baby and knew that the time would come. I was glad of the extra time to cook lots of healthy dinners for the freezer, sew, nest and catch up with friends. Medical induction was not something we planned to use, but by week 41 we were getting quite keen to see our baby. Business was very busy and we wanted to make sure Shawn would have some snatches of time at home. Easter weekend was coming up – ‘how perfect!’ we thought, a long weekend for Shawn to have at home. We hoped that baby wasn’t far away. We had decided to try some natural techniques to encourage labour so I ate a lot of pineapples that week. Good Friday was spent eating hot cross buns with Shawn’s family before we headed to the lake for some serious walking. I pounded a route up and down the steep paths on one side of the lake for as long as I could. And we tried the other well-known technique once we got home as well! Sure enough, at about midnight I woke to feel a tightening in my belly. Then it happened again. Having had no Braxton Hicks or real tightenings before, I knew that this might be labour. I texted our midwife because I was so excited, but managed to control myself enough to not wake Shawn. The squeezes were mild enough for me to get some more sleep and it wasn’t until about 4am on Easter Saturday that I woke again. This time I couldn’t help but rouse Shawn and we both got straight out of bed like kids on Christmas day. The contractions kept coming in rough 10-15 minute intervals, but they were very manageable. We mooched around and enjoyed a delicious pancake breakfast then decided to go for a walk round the block. It was probably the slowest walk of my life, but I enjoyed the fresh air and the distraction. I stopped now and then to lean on a fence if a contraction was a bit achey and Shawn ran across to the shops to get us some DVDs. Back at home we parked up on the couch and I remember bits and pieces of ‘Despicable Me’, sleeping on and off through the end of it. By the time Shawn started the second film I was feeling a lot more like a woman in labour and had to ask him to turn it off – the voices and the characters were grating on my nerves and I needed quiet. I asked him to put on some music instead and pull the curtains. Then he left me alone, which was exactly what I wanted. I was lying on the couch when my waters popped – the force of them breaking was so strong that Shawn saw my whole body shake. This was a very cool feeling and a really distinct memory in my mind. We let our midwife know where things were at and she said she’d pop over for a quick early labour visit around lunchtime. By the time she came I was well into some good contractions and Shawn had started to assemble the birth pool and fill it. Our midwife politely told him to stop filling the pool as it was early days in the labour. I think Shawn just needed something to do, but now he had a buddy to sit with and share many cups of coffee, so he could relax. I had backed myself into a corner of the lounge, standing and leaning over the back of the rocking chair, swaying my hips or circling them in a figure of eight. Sometimes I knelt and leant forward onto the ottoman, but for the most part standing felt good. At times I used a hot wheat bag on my lower back. I felt like a Michel Odent chapter had come to life – here I was seeking privacy and security like a fellow mammal in a shady corner of our house. All the yoga positions and movements came into play and using them was one of the only things that I was still doing consciously. I would also let our midwife know when I felt baby move and went to the bathroom when I needed to pee. Everything felt right and as it should be, I felt safe, uninhibited and able to focus on my body and how to play my part in birthing our baby. After a while I guess our midwife realised she was going to be staying put and she gave Shawn the okay to fill the rest of the pool. I was glad to hop in, the water felt so soothing and supportive, and the warmth felt good. Physical touch from others was something I felt I wanted to avoid – the odd squeeze of my hand was all I remember, but I couldn’t tell you if it was my midwife or Shawn as I had chosen to have my eyes closed. Once in the pool, I started to close in and get serious about this birth. At about 2pm contractions were two minutes apart and lasting about a minute. Baby’s heart was now being heard with the aqua Doppler instead of the beautiful wooden pinard. My eyes stayed shut for what felt like hours, I hardly spoke and I would just open my mouth and say ‘water’ or ‘orange’ as a signal to my two buddies that I wanted something other than their silent company. Grumpily, at one point I asked everyone to turn their phones off, and to unplug the landline too. I didn’t want interruptions! The contractions were well established and getting stronger. I shifted between leaning back against the side of the pool and kneeling on all fours. When a contraction came, I would breathe out and vocalise. I consciously made as ‘open’ a noise or breath as I could, opening my mouth and keeping it soft, leaning my arms wide on the sides of the pool and spreading my fingers with palms out or facing up. These small actions really helped me to surrender and let labour happen. I felt strong and I knew that things were going just fine. A few hours later and the contractions had moved up a gear. I found it harder and harder to breathe out evenly and slowly without wanting to just puff hard or pant. I had to work hard not to let the enormous power of the contractions take me down the path of tension and pain. When my hands sought to grip the sides of the pool, I had to release each finger and consciously turn my palm up, pushing the tension away with an open gesture. My sounds would start out open and low and then, as the contraction intensified, I would struggle to stop from screwing my face up and going high-pitched. The openness I was previously maintaining in my hips and the mental image I held of my cervix opening like a flower were replaced by a desire to curl over and push. After half an hour or so of this feeling I had worked out how to use the new energy in my body and work with the stronger contractions. There was less time to rest between them and I felt a huge amount of pressure in my bottom between pushes as well. Suddenly, I was a new woman, eyes open and talking again. Our midwife contacted the second midwife and asked her to attend. I was using a squat in the pool now and each push forced my poo into the water. It was at this stage that we all started to notice some thin meconium in the water, but it didn’t trigger any concern in me and I could still feel baby moving between pushes. My midwife suggested that I try a few contractions out of the water to see how it felt with additional gravity acting on me. I clambered out just in time for the next effort and more meconium appeared along with stringy clear mucus. Conversations about baby being breech began to happen – quick snatches of short, precise questions in between the big pushes. I consented to a vaginal examination and we found that sure enough, this baby was coming out bum first, hence all the meconium. I was fully dilated and baby was not far from fresh air. This was not quite what I had expected! Suddenly I had shifted away from my hands-off, mammalian experience and my midwife had performed a VE, something I knew she would only ask to do if she deemed it absolutely necessary. In the next short break we discussed options and the choice of transferring to hospital. I asked both midwives what that might entail, even though I didn’t seriously think I would choose that path. Intuitively I felt that things were going okay and hearing that baby was so close made me certain that he would be born at home, as planned. My midwife asked me for a decision, I gauged my energy levels and knew that I had plenty of power left to do whatever was coming next. I told her we were staying put. It wasn’t a completely calm atmosphere at this stage. Conversations about risk had stiffened the mood and the consequent tension felt palpable. Everyone has heard birth horror stories and I knew that breech was a word that struck more than a little fear into some people’s hearts. I guessed at what thoughts might have been running through my support peoples’ minds, but they never voiced any such concerns, never influenced me with suggestion or doubt. For that, I am truly grateful and I know it to be the mark of an exceptional midwife and a trusting partner. Listening to baby’s heart was now happening more frequently and the rate was not always as high as we would have liked. Each time, I just waited for the next listen and it would seem to come up a bit and relax us – or maybe just me! My midwife suddenly transformed into an active midwife, moving to kneel beside me on the floor and talking to me through each push and in between. Mostly she voiced words of encouragement, affirmation and comfort, but she also gave some clear instructions to coach me through the pushing. She placed her hand on my lower back and put pressure there to keep me in a low squat throughout the whole push, when my body wanted to rise up and away from the incredibly stingy, hot feeling. I guess we all knew that each push had to count now. At one stage I reached around to feel for baby and touched his little slippery rump. What an amazing feeling – I was actually having this baby, right here on the lounge floor! Beren was born just 30 minutes after we discovered he was in a breech position. I had used every ounce of my strength to not waste a single second of each push. I recall some very low vocalising to match the low aching and intense pressure on my perineum. After Beren’s bum had slithered down, the next thing to appear was a pair of big testicles! Shawn saw them and knew that Donkey was a boy after all, but he kept quiet and the surprise was intact for me to discover myself. Next one leg slipped down, then the other came as his chest and head were born slowly over a contraction. Gently, Shawn and our midwife juggled two pairs of hands to take hold of our slippery little bundle. Just before 6pm our baby was here, born without fuss, just the way he wanted to be. He didn’t cry, just gave a little cough. I sat back from my one-knee-up position, relieved to rest my quads and catch my breath. I felt like a million bucks holding Beren for the first time. Staring at him, I could feel nothing other than joy, love and satisfaction at our birth journey. I remember saying, “That was great. I don’t think I tore or anything!” My midwife just smiled at me, knowing that those magical hormones would be protecting me from feeling reality for a while longer. Unlike her, I had no idea that Beren’s birth had resulted in a tear. At our second midwife’s suggestion, I gave Beren some big ‘kisses’, blowing air into his nose and mouth to help open his lungs. He was covered in goo and blood. Beren’s cord had torn with the birth of his head, and Shawn’s massive homemade birth mat was decorated with scarlet drops from corner to corner! A bit of Angelica and some pushing helped to bring the placenta down after about 40 minutes. During this time we talked and talked, about the labour and the birth, the breech surprise, the size of this baby (he hadn’t yet been weighed but was clearly large), Beren’s name and that he was a boy after all. We managed a few photos, but have made a mental note to do this better with our next birth. Shawn had some very special cuddles with our towelled-up bundle, Beren nuzzling at his dad’s chest hopefully, while my midwife got the pool warm for me again. 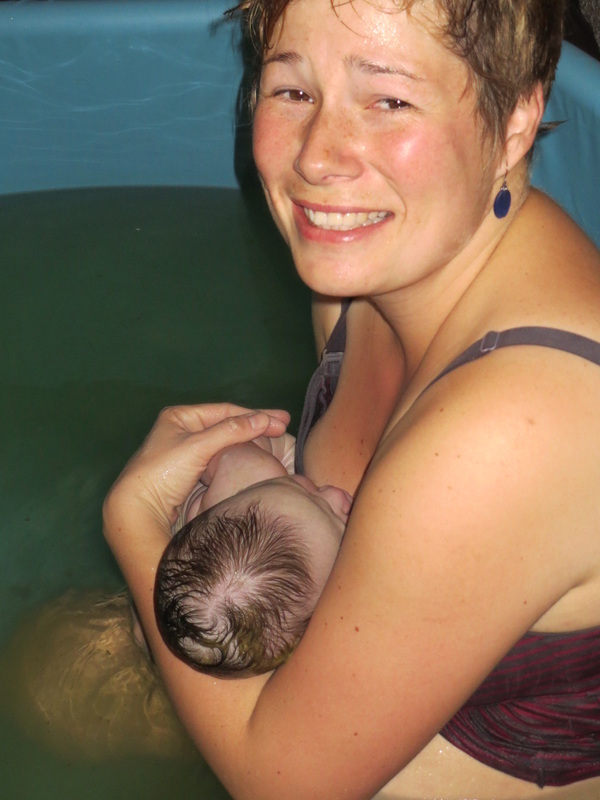 Having hopped out the pool to give birth on land, I was now grateful to climb back in with my new son and slosh around in the water, feeling warm and washing our skin together. Beren was quite stunned at first, but came round quickly, announcing his presence with small cries now and then. He started to look for my breast in the pool, but we found it easier to sit and snuggle on the couch where he could suckle onto dry skin. He did a lot of licking and latched on and off, but wasn’t overly interested in breastfeeding quite yet. Almost two hours after his birth, Beren’s cord was clamped and cut by Shawn. Beren’s little body was reluctant to uncurl and stretch – we realised he must have been breech for some time by the look of his bent-up frog legs! He wanted to stay in this position which made him quite a challenge to hold and hard to get him close to the breast for a feed. Football hold was the best position at this time and he managed to latch then settle for a wee nap at about 8.30pm. We all took the chance to look at the placenta and admire it – what a clever organ. Our post-third stage plans involved consuming part of the placenta so Shawn took it to the kitchen where he cut off a chunk before freezing the rest. We planted the majority under a beautiful new Titoki tree in our garden and Shawn prepared the smaller chunk into tiny pillules that we froze on sheets of Gladwrap. I swallowed these straight from the freezer with a drink each day until they were all gone. At about 9pm we moved to the bedroom where my midwife broke the news that I hadn’t birthed this big boy without a scratch! Oh, I was a bit let down to hear that I had a second degree tear and totally surprised because I still couldn’t really feel a thing. The tear was pretty straight and sat together quite nicely. Consequently, I chose not to have stitches and we talked about natural wound care and how I would look after myself over the coming weeks. There were days when this was a really hard part of being a new mother, but overall I was amazed at how quickly I healed and returned to feeling absolutely normal. The healing properties of Manuka wound honey and Calendula Sitz baths cannot be overstated! We weighed our sleeping beauty and got a shock when he tipped the scales at 4.55kg (just over 10lb). No wonder I had such a big bump yesterday, this was a giant baby! So now we were parents – what a fantastic feeling. As we all cuddled up in bed together I couldn’t imagine any other way to have spent the day. I was tired and sore and enormously emotional, but all was well. As the realisation that I had birthed a big breech baby at home sank in over the next few days, I drew such pride from this achievement, knowing that it was a little bit unusual in a society that still encourages the medical model of care for this kind of situation. It was almost as though I became a more complete woman after giving birth, like a new piece of the puzzle had fallen into place. That feeling gives me so much joy every day. Birth is a momentous gift for the mother as well as for the baby being welcomed. I am so grateful that I chose home birth and received that gift on my own terms and in my own time, surrounded by amazing people. Willis was born on a Sunday morning in our bedroom. He waited patiently until 42 weeks and stayed safe inside my body while we nursed a sick toddler with a nasty virus at 41 weeks. He worked with me through a steady four hours of 'real' labour, building to some powerful double-peaked openings before an intense change occurred. I had hopped in the pool already and was reaching the point where my openings were getting a little but beyond my ability to stay calm and breathe to keep up. I remember getting a big chill and slipping a thermal top on. Suddenly I felt a huge pop and my forewaters released, immediately triggering the mother of all openings where I roared a four-second long 'f**^%@$#^#*l!' which brought my friend and our son trotting down from the lounge where they had been playing. Absolutely uncontrollable, my body started to bring Willis down and I felt between my legs for his head - hurrah! I provided an entertaining commentary for everyone around the pool as I described what body parts I could feel. Minutes later Willis was guided through my legs by Shawn and we cuddled for the first time with happy tears dripping into the water. Several things about Willis' birth were especially wonderful for me: getting to experience a head-down birth for starters, birthing in water and lastly, watching our whole family calmly embrace the day that another baby was born at home - particularly our two year old Beren.